Almost 60 percent of eligible Aboriginal communities along the [desired route], representing 60 per cent of the First Nations’ population (and 80 per cent of the combined First Nations’ and Metis’ population), have agreed to be part owners of the proposed Northern Gateway pipelines … Half of the equity units taken up went to groups in British Columbia, and the other half to groups in Alberta. Meanwhile, according to an April 3, 2012 Vancouver Sun article, dozens of BC First Nations “along the pipeline route, Fraser River and coast … [have] signed their names to [the ‘Save the Fraser‘] declaration calling for an ‘unbroken wall of opposition’ to pipelines and oil tankers along B.C.’s coast.” The map shown above (produced by the affiliated Yinka Dene Alliance) depicts the boundaries of that wall. That same Sun piece indicated it’s a different story in Alberta, in that most First Nations there “have not said whether they support or reject the 1,172-kilometre pipeline.” The only one prepared to go on the record — the 2,000-member Cree community of Driftpile First Nation — did so to register their opposition to Northern Gateway. On the Métis side of things, opinion appears split, at least in British Columbia: the BC Métis Federation shared its “extreme disappointment” back in April and more recently over the decision by Métis Nation British Columbia (MNBC) to sign an equity deal with Enbridge. But beyond this, the picture remains incomplete. Which, to me, seems like a prime opportunity for some investigation of the crowdsourcing variety. That’s where the widely-distributed individual efforts of the many are pooled together toward one goal. In this case, my open call for assistance asks that anyone who should happen to live in/near an Alberta/BC First Nation falling within 80 km of the proposed pipeline route (or know of someone else who does) is asked to please confirm/deny whether said First Nation is one of the 18 to have supposedly signed an Enbridge agreement. If/when you do, I’d ask that you tell me so in the comments section below; I will draw on them here, amending the master list as I go. British Columbia represents 37 Métis chartered communities in BC. George and New Caledonia communities are. appears that Enbridge has decided that this can also include the MNBC. with the two communities that are registered with them already. MNBC is one that has agreed to the equity package. I am happy to read that some Indigenous people have taken a stand-against- their chief and council. Because signing with Enbridge, I could only say it is like signing away deeds, only to give back to the devil. Both actions are not needed on these coastal (BC) and mountain lands. Enbridge must pack up, and leave these peaceful lands into more capable hands. Poisoning, or taking the rivers, lands, and animals, from Indigenous peoples’ care, are not an answer to stimulate their Canadian economy, ever. 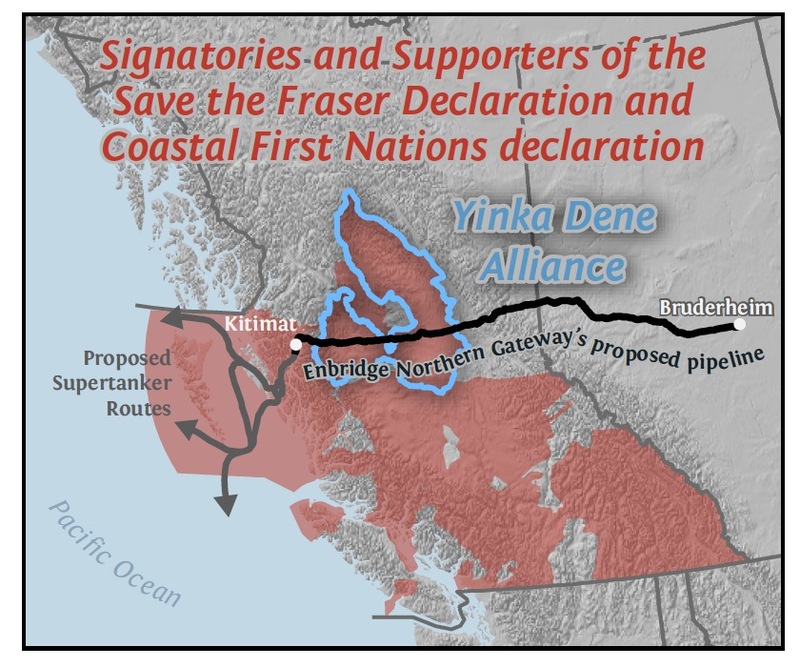 The Nisga’a and the Gitxsan have each issued statements declaring their opposition to the proposal by Enbridge. This is an area not included in your map. Enbridge Northern Gateway Project were discussed and weighed carefully.